Using a wide strip vegetable peeler, peel the carrots into long, even strips, stack then on top of each other and slice them into fettuccine sized strips. Add to bowl with olive oil, sea salt and lemon juice. Let it sit for 5-10 minutes and the carrots will soften. Add the Cilantro Pesto and hemp seeds and mix well. 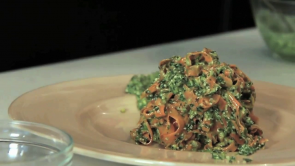 Take a dollop of pesto and drag along the plate. Put the Carrot Pasta in the center of the plate and add extra hemp seeds and cilantro for garnish. Enjoy! More About Doug McNish After attending George Brown Culinary Chef Program, Doug took an apprenticeship and continued to hone his skills learning the inner workings of a busy professional kitchen. After working for Toronto’s best chefs in some of the most challenging atmospheres he found that he needed to make a change. By taking what he already knew from his years of culinary training he began to relearn how to prepare food in a healthier light. Pairing this with a deep concern for the planet and the welfare of all it’s inhabitants the next most logical step was to become vegan. Since then Doug has taken healthy, organic, plant based cuisine to a whole new level.